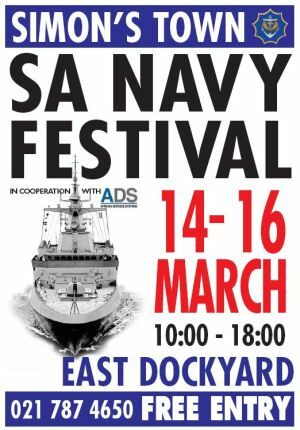 The annual South African Navy Festival will be held this weekend, from Friday 14 through to Sunday 16 March at the Simon’s Town Naval Base. This is the time when the navy literally opens its doors to the public, to come and see what the navy is all about and an opportunity to see at first hand just how your tax rands have been spent. On display will be ships of the fleet, which will be joined this year by the ships of the German Navy task force that has been in our waters for about a month undertaking exercises with the SAN. But it’s not only about ships – it’s also about people with a variety of events that are aimed at keeping everyone, of all ages, entertained and excited throughout the three days. The gates of the naval base will open at 10h00 each day and close at 18h00. Entrance is free but parking is going to be at a premium and visitors should be prepared for a long walk. Alternately consider using the Simon’s Town trains which leave from Cape Town main station throughout the day and evening. Ships of the SA and German Navies will be dressed (flagged) and open to the public.